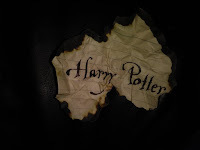 I should start this post by saying that I am a huge Harry Potter nerd. 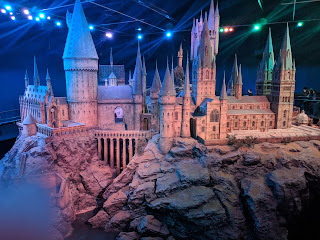 So when I say that my trip to the Warner Brothers Studio Tour was one of the most amazing things I have ever experienced, you will know how true it is, and how much it meant to me going there for the first time. 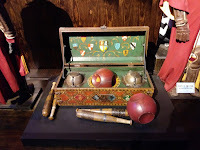 Be warned that there are what could be considered spoilers of the tour in this blog, so if you haven't been and want a complete surprise then I'm not sure you want to read on. I went with a friend of mine as part of an invite only bloggers event, which as a new blogger was an amazing opportunity for me. 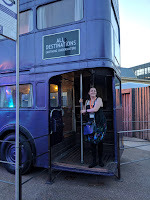 When we arrived we were given our lanyards we were told to collect our tickets at the end of the entry tunnel, and honestly, before we even got to the end I was like a kid at Christmas since the walls were decorated as though they were a part of the Marauders Map. Honestly I was ready to explode with excitement and we weren't even in there yet. 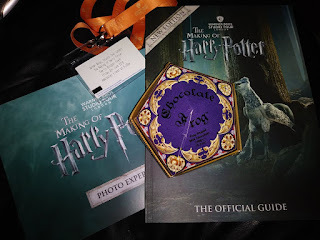 When we got our tickets, it was a lovely Goblet of Fire lanyard and contained not only our entry tickets, but also tickets for some opportunities inside the studios. This included a green screen photograph, a drink of butterbeer, a souvenir chocolate frog, and complimentary food and drink. We were also given a guidebook of the studios. 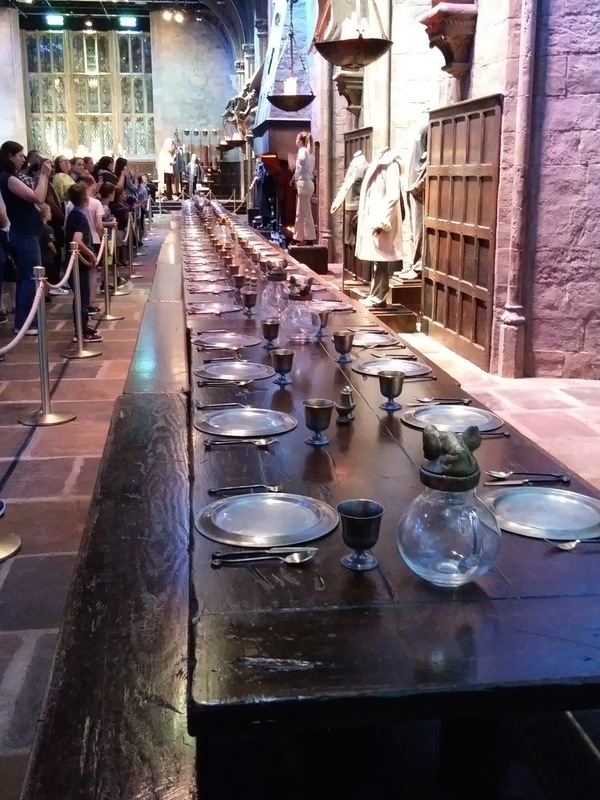 Once we had our tickets we waited in the main entryway for the tour to begin, and once again the excitement started to build since this room had a giant Triward Cup in it which was used at the movie premiere, not to mention Mr Weasley's flying car suspended from the ceiling. As we queued to enter the tour we were also able to see the cupboard under the stairs, which of course was Harry's bedroom for his first 11 years. All of this before we even entered the tour, the excitement of everyone there seemed like a tangible thing at that point. As we finally entered the tour it was introduced and we were treated to a quick show of how Harry Potter came to be made, and then into what was pretty much a cinema to watch a lovely introduction video, and then the doors to the great hall were magically revealed, and honestly the emotion that rose in me then was surprising even to me. 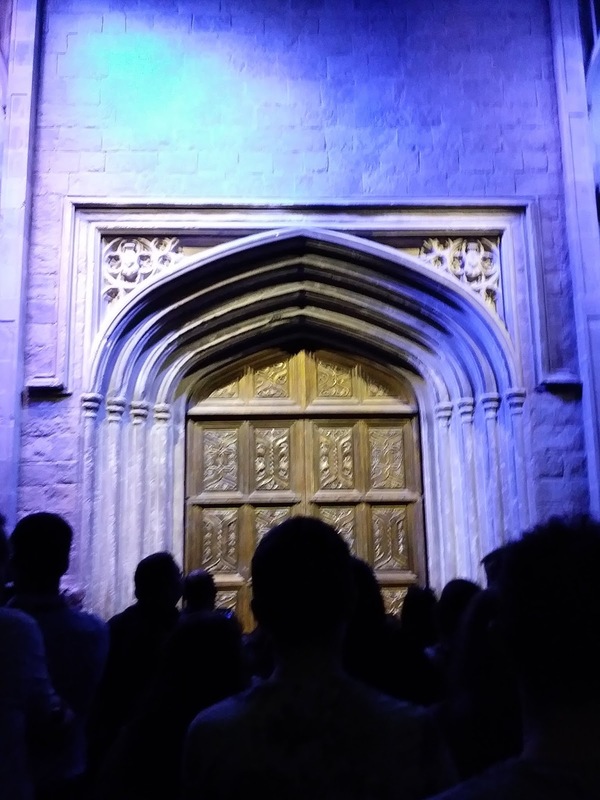 The great hall was amazing, it was so beautiful, and everything I wanted it to be. I almost expected a group of Hogwarts students to come running in and sit down at the house tables. After that, the guided part was over and we were left to go round the tour at our own pace, which in my case was pretty slow because I needed to see absolutely everything (and quite possibly annoy people around me by giving random facts about things too). The first area we came to were the castle interior sets and props. The yule ball costumes and props were all extremely beautiful (I'm particularly fond of Ron's dress robes even though they are the least pretty to look at). The Gryffindor tower sets were extremely cosy, which is exactly as I expected since they always seem to have roaring fires and plush furniture, in fact a part of me just wanted to go and curl up in one of the armchairs with a copy of Hogwarts: A History. 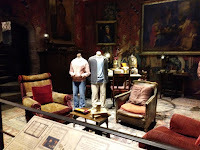 The boys dormitory set was no less cosy seeming, although you can certainly tell that the beds were built at the beginning of the series since they certainly weren't made to accommodate the full grown Gryffindors in the final films. The potions classroom was alive with details, including labels on each of the ingredient bottles, and copies of Advanced Potion Making on each desk making it easy to pick out Harry's old battered copy amongst the others. You have the chance to look in the Mirror of Erised, which in my case did show my hearts desire since it showed me myself at the studios, wouldn't have minded it showing me a bit taller too though. Then it was on to the magnificent room that is the office of the greatest headmaster that Hogwarts has ever seen, Albus Dumbledore. Past the iconic griffin-door, and into the beautiful room lined with portraits of past heads of the school. 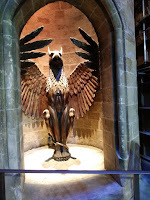 There are so many books and instruments on shelves around the walls, and in pride of place is the pensive, which looks very mysterious lit from beneath, you can certainly see why it made teenage Harry curious. Outside of the office is a cabinet with the horcruxes in it (not Nagini of course, but you do get to see her later on in the tour). Following this are 2 of the most homely (and cluttered) sets, Hagrid's hut, and The Burrow. Hagrids hut is lovely to see, especially with Fang sat at the entrance keeping watch. 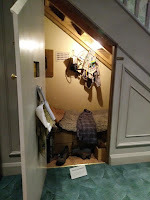 But it's the Burrow that really gets you, not only does it have Mrs Weasley's unique clock, but you can also do a bit of magic yourself in this area. With just a wave of you hand you can make some knitting work by itself, along with other household tasks. If only it was that easy to do it all in my own house. Sticking with interactive opportunities, after this we moved on to the quidditch area, where you can do the green screen broomstick experience. Riding a broom through various scenery, and also having your photo taken flying. You may think that you'll look a little silly riding a broom in front of a green screen, but once you get on there you're too busy having fun to care what you look like. And once we had our photos it was on with the tour. Next is the dark arts section of the tour, including the sets from Malfoy Manor and the Ministry of Magic. Seeing Charity Burbage suspended over the table at the Manor was quite chilling to be honest, although given that it is clearly a set I think it might just be my mind filling in the blanks that caused that to be the case. The Ministry was magnificent, and the Magic is Might statue was everything I thought it would be. 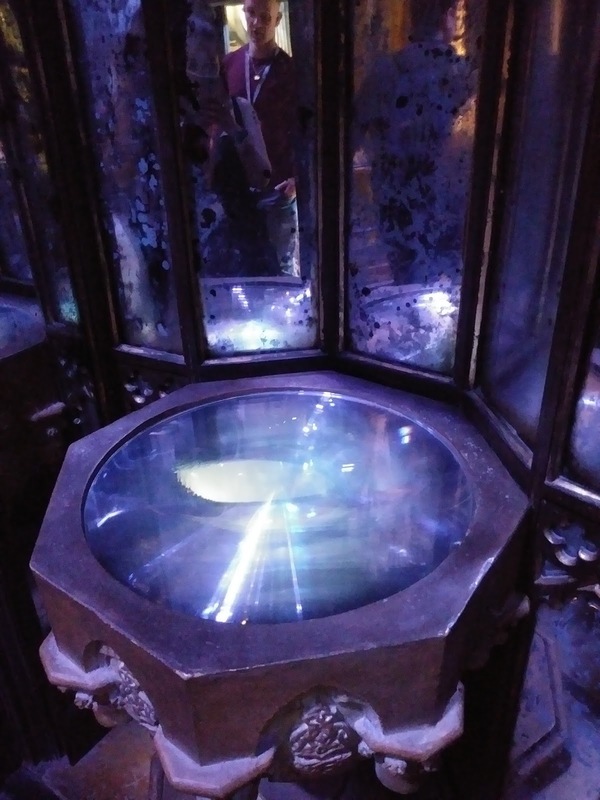 However my favourite parts of this area were the Riddle grave because it was so sinister and imposing, and best of all, Mad Eye Moody's trunk because above it was a mirror that showed a reflection of the real Moody inside the 7th level of it, which I think is an amazing effect. After that we moved on to a section of the tour that was not necessarily any less dark, but dark in a very different way. Even though I knew that I was inside and it was just a film set, walking in to the Forbidden Forest was eerie enough to make a little bit of my brain forget that. The darkness, the mist on the floor, the huge trees surrounding us, all of it came together to make me feel like I was really there in a creature filled woodland. Seeing Buckbeak in there just added to the effect, and I actually felt like I needed to bow before I approached him (which of course I did). As we carried on through there were more spiderwebs, and just like Ron I don't like spiders, so when we were confronted with Aragog and his children it was pretty terrifying, even though they weren't real, seeing giant spiders descending from the ceiling is a rather jarring sight. The next set that greeted me also brought me up short, but not because it was terrifying. Platform 9 3/4 was just around the corner, and seeing that huge crimson steam engine made me feel like an 11 year old going to Hogwarts for the first time, heart racing with excitement and a huge smile on my face. Before boarding the train of course I had to push a luggage trolley through the wall, and then finally I experienced the moment that every Potter fan secretly (or not) dreams about. 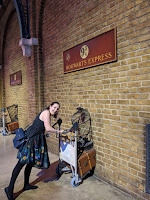 I boarded the Hogwarts Express. I walked down the corridor, looked in the compartments for each year of filming, and I waved out of the open window at the people in the station below. 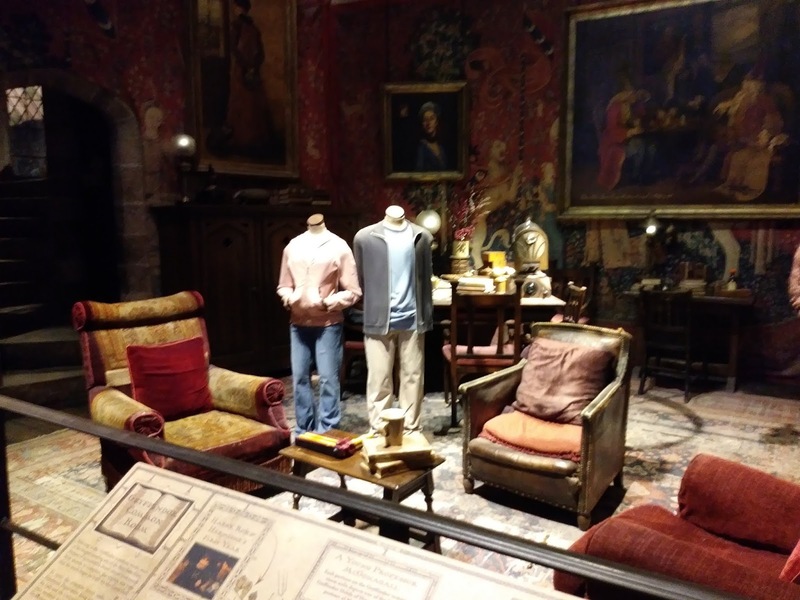 There was a compartment set up with the props from each year, and then at the end one set up with not only the sweets and sweet trolley, but also the costumes from the Philosophers Stone, Harry and Ron making friends for the first time. 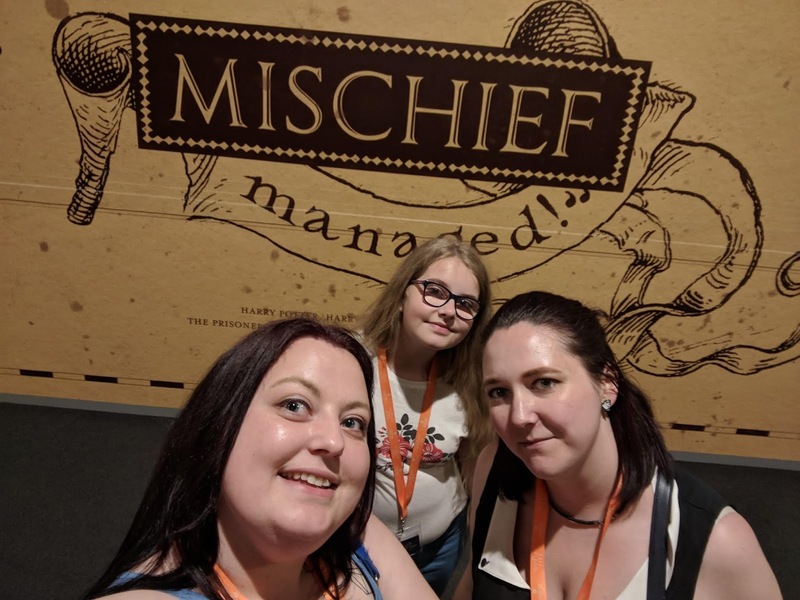 There is also a green screen area here which I didn't expect; however sadly we didn't have time for this, and we had already used our green screen pass on the quidditch, but if I go again it's something that I very much want to do. 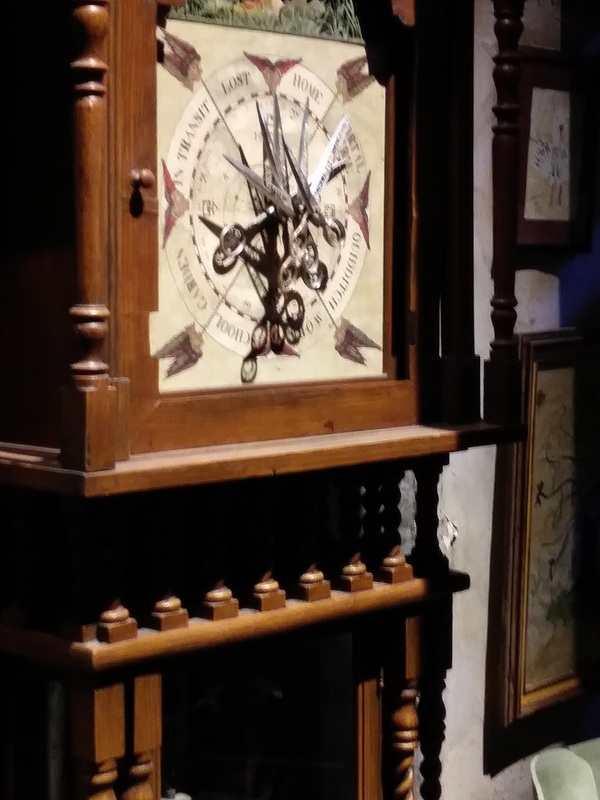 After that it was past the glass cabinet of props, including a beautiful Marauders Map, and then into the Backlot Cafe. Here we had our choice of hot meal, and it was nice enough, but honestly the star of the show here was of course the butterbeer. It wasn't necessarily my cup of tea to be honest since the idea of fizzy butterscotch doesn't really appeal to me, but the cream on top was lovely, and the ice cream was to die for. 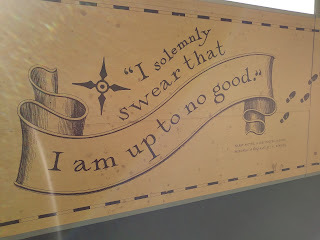 I am however very happy to have tried butterbeer even if I won't necessarily have it again next time I go. I think I'd prefer firewhiskey, shame they don't serve it really. From inside the Backlot Cafe you can see out into the actual lot, which is where we went next. This is where you can see the outdoor sets, so looking out of a window and seeing Privet Drive was quite the sensation, although not quite as good as walking through it's front door. 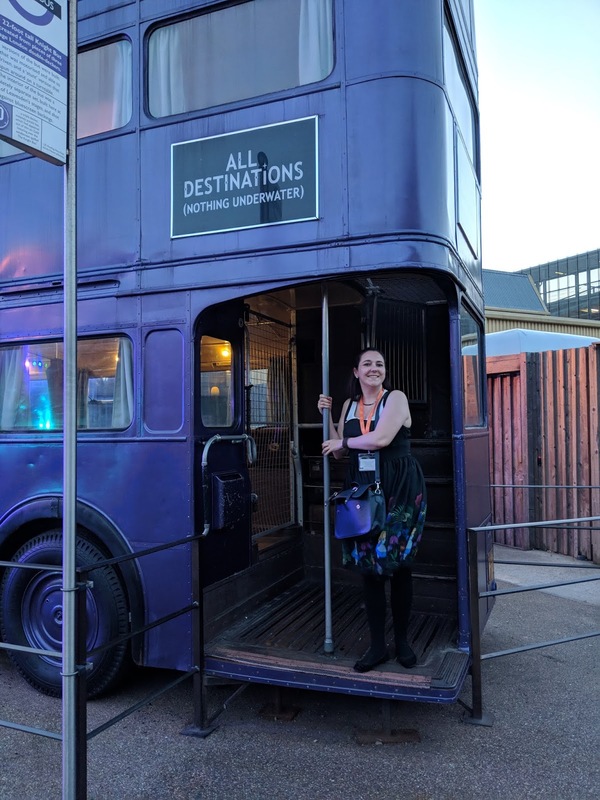 Another amazing outdoor attraction is the triple decker Knight Bus in all it's purple glory, and you don't even have to hold out your wand hand to flag it down. The Hogwarts bridge is also there and walking across it was wonderful, but I think for me, the best of the outdoor sets has to be the exterior of the Potter's house. Standing there viewing it as Harry and Hermione did with it's roof blasted apart was great, although I must admit that I was a little disappointed not to see a sign with messages of hope for Harry, but of course you can't have everything, and even without it the house was perfect. 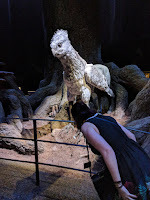 The next thing we saw was the creature room, there were some amazing models in here; although we didn't spend much time in here because we still had a lot to get through, seeing Dobby was a magical moment for me, as was seeing the Thestrals. 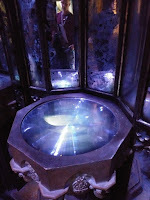 A more disturbing part of this room was the miniature Voldemort that goes in to the cauldron, It was cool to see, but not exactly the prettiest of the things we saw in there. 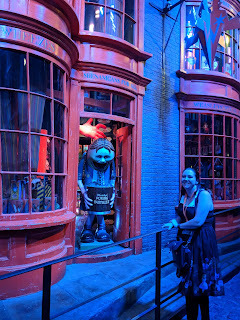 Walking into Diagon Alley was pretty much a dream come true for me, as lovely as the tour gift shop was, this is where I wished I could be doing my shopping for real. 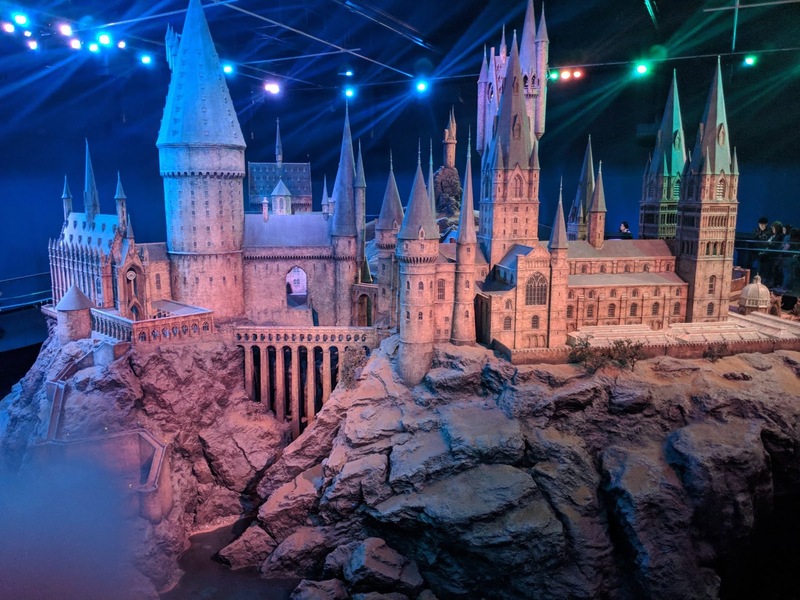 Obviously my eyes were seeing this amazing set surrounding me, but my mind was thinking of the books/films and all the things that happened in these places, Harry having ice cream at Florean Fortescues, meeting Malfoy for the first time in Madam Malkins, getting Hedwig at Eyelops. All of these little moments were flooding my brain and seeing the places where they happened was just mind blowing for me. 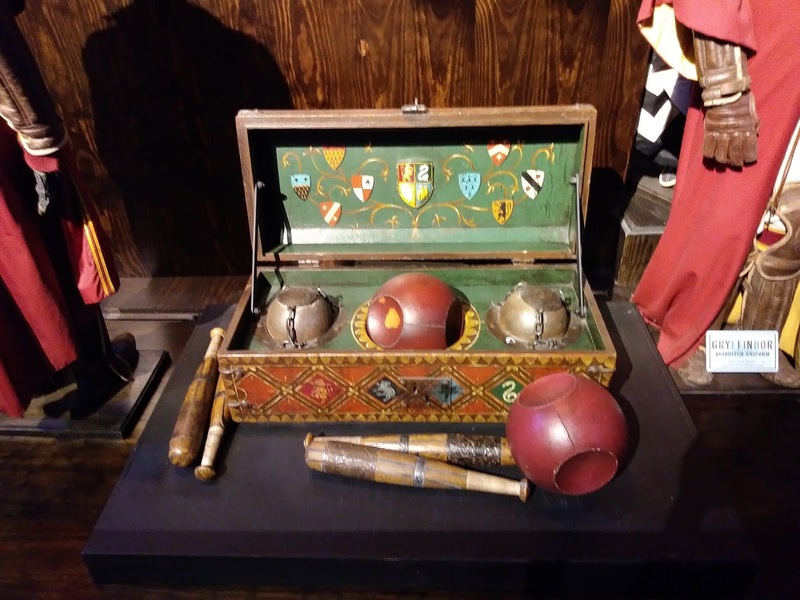 But of course I can't talk talk about Diagon Alley without talking about the jaw droppingly fabulous Weasley's Wizard Wheezes, I mean, who doesn't want skiving snackboxes, and extendable ears. I could just picture walking in there and seeing the twins in their element, it really was a magical moment for me since the twins were my favourite characters. The highlight of the entire tour for me though was without a doubt the Hogwarts Castle model. I walked around the corner into that room, and I almost cried at the sight that greeted me. I'm posting pictures here, but honestly there is no photograph that I could show you that would do it justice. The entirety of the English language seemed to fly out of my head leaving me at a total loss for words to try to describe what I was seeing and feeling at that point. I can write about how beautiful it was, and how amazing it was seeing the castle lit up inside, and all of the fantastic details, but really, it's something that you just have to experience for yourself. 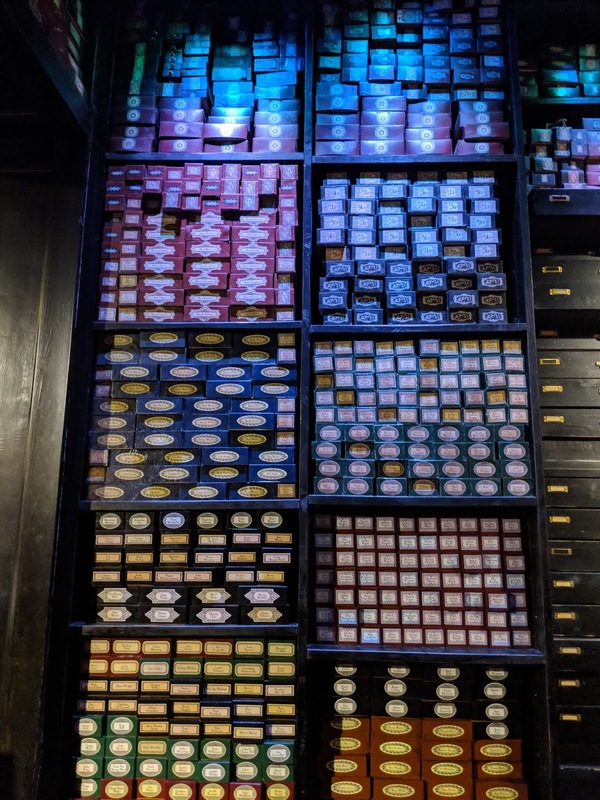 After that it was into the wand room, it was basically like walking in to Ollivanders, wands lining the walls from floor to ceiling. 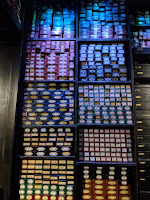 Only in this case each wand box had the name of a cast and crew member who worked on the films, and the scale of that is just unimaginable really. One person for each of these boxes, working in this amazing studio is just such an amazing thought, and really gives an idea of the scale and magnitude of just how much effort from how many people went into making this epic story become a reality. 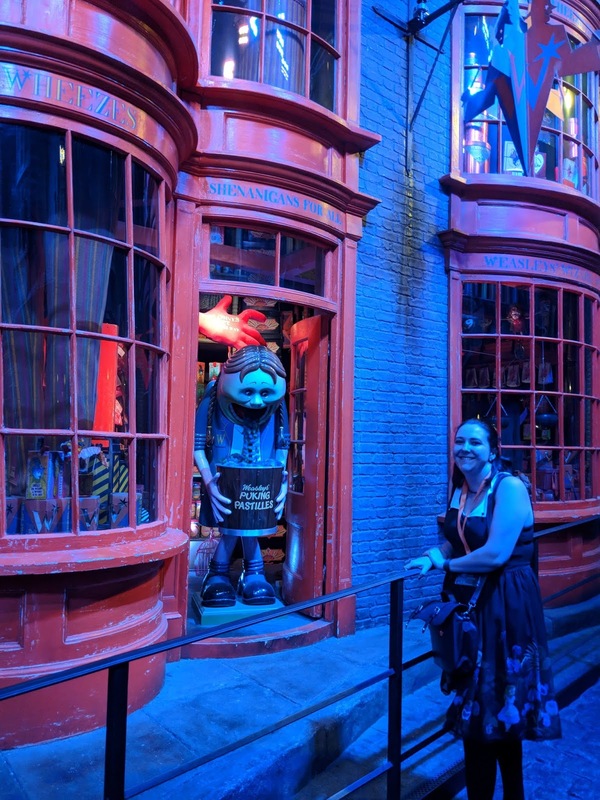 Finally we made our way into the studio shop, where although I tried to not bankrupt myself I did have to buy at least a couple of souvenirs from my visit, including a beautiful embossed Ravenclaw notebook, and a Ravenclaw charm. 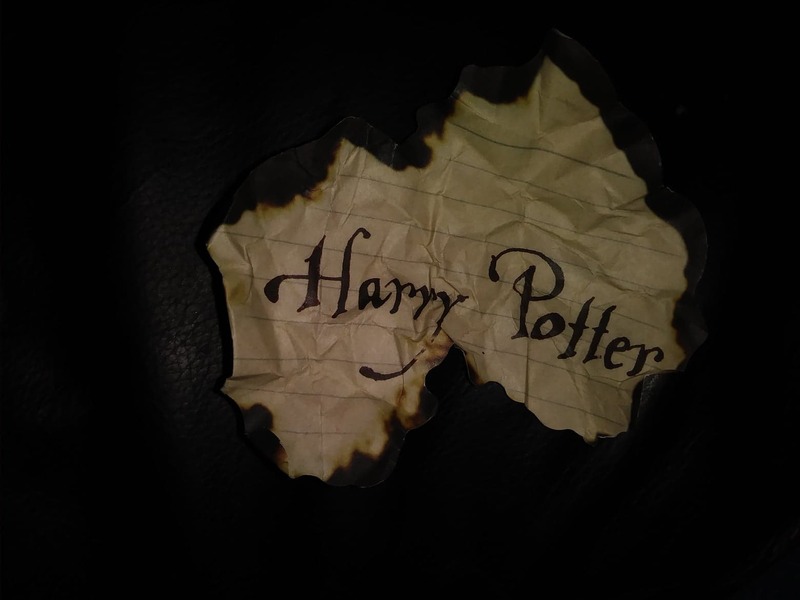 Sadly after that the tour was over, although even though the experience ended, it's safe to say that the feelings it inspired in me (just like the books and films) will stay with me for a long time to come. 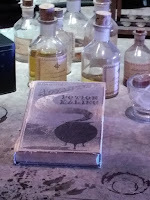 I really hope I will make it back there again some day, because even though I have already seen it, just like when you re read your favourite book, I get the feeling that there are still more surprising and unexpected details to make themselves known. If you haven't been then I really would advise you to go, especially if you are a Harry Potter fan, I promise that you won't regret it. 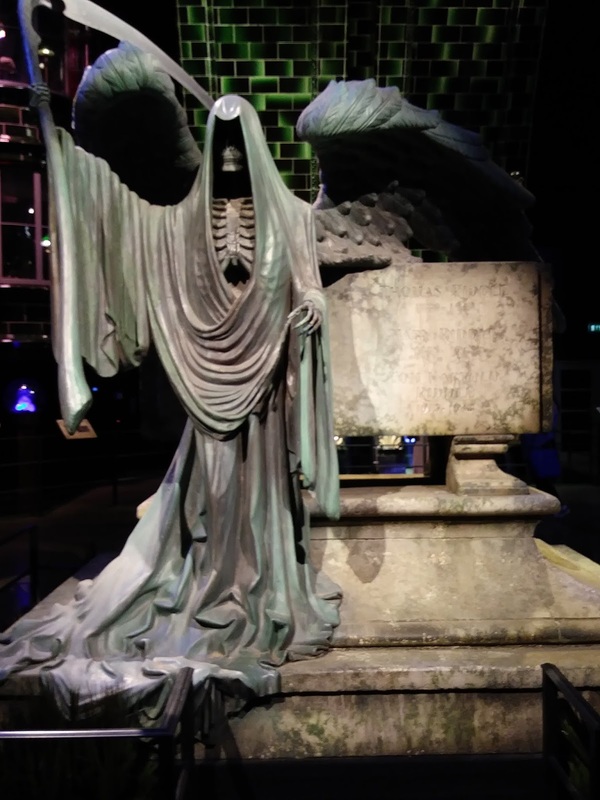 I would absolutely love to go to the studio tour one day it seems like they have so many amazing props and themes going on! Ohh my eldest son went here with his grandparents and LOVED it! I've still never seen the film or read a book, it would be lost on me! I loved all the books and movies so for me this looks fantastic. I would love to go visit with my children as they would really enjoy it having seen some of the movies too. Oh my goodness I want to go there too! 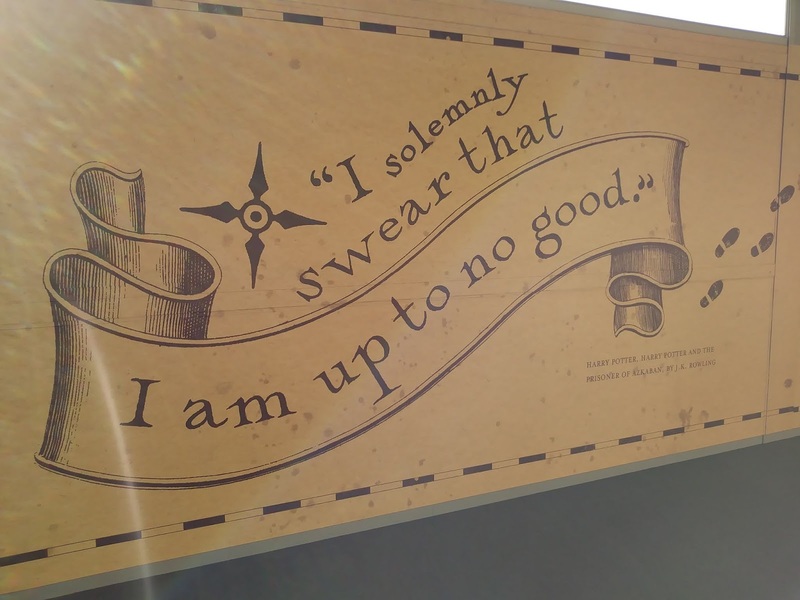 I'm such a big Potter fan and this sounds like a fantastic place! Oh my goodness, this sounds absolutely magical. 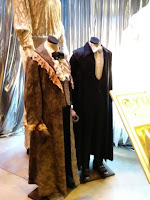 I've always wanted to go on the WB Studio Tour, I'd be just the same as you - like a kid at Christmas! It's on my bucket list. I only got into HP last year and am still working on my girls. Would like to think we will visit here one day as everyone always says its such a fab day out.